Facet joint syndrome or facet joint degeneration can occur in isolation or as part of a generalised degeneration of the entire joint, including the disc. Facet joints are pairs of joints each one located on either side of the spinal column. In the lumbar spine, the joints tend to face each other with a small portion of the joint facing backwards to form a J shape as outlined in the diagram below. This shape has an important mechanical function because the “J” section which faces backward limits forward/backward motion and the “straight” sections which face each other limit rotation . Each facet joint is lined with articular cartilage (this is the smooth covering that covers all joint surfaces) and each joint is held together by a sinewy elastic capsule known as the joint capsule. Just like any other joint capsule, there are bundles of small nerves which supply the joint and therefore transmit painful information in the event of the joint being irritated. The primary function of the facet joints is to limit end-range motion and control general movements of the lumbar spine. Each Lumbar vertebrae can only rotate about 3 degrees to each side and when this happens the articular cartilage on joint surface is compressed. When we bend backwards the joint surfaces are compressed on both sides. When we bend to one side, the joint surfaces are compressed on the side we bend to and are stretched on the opposite. Forward bending is slightly different because as we bend forwards, each vertebrae gently slides a couple of millimetres forwards in the direction of movement. As a result that the front part of the zygapophyseal joints are put compressed at the limits of forward bending. The surrounding joint capsule, together with the associated ligaments and the inter-vertebral disc are also loaded with forward flexion. In the normal course of events, the zygapophyseal joints are not weight-bearing joints. However, estimates suggest that in upright standing, less than 20% of our body weight goes through these pairs of facet joints in the lumbar spine. However, this can change in the presence of disc disease which reduces the space between the vertebrae and therefore allows more pressure to distribute on the facet joints. One of the hallmarks of facet joint pain is how specifically symptoms are located directly underneath about 5cm from the centre of the spine. Patients can usually place their finger or thumb directly over the painful joint and specific physical examination tests usually reproduce the symptoms. Sometimes pain is sharp/ catching and often perceive as nerve pain – but it is in fact symptoms arising from irritated joint structures. As we discussed elsewhere in an article about sciatic pain, nerve pain is sharp in nature but it radiates along the path of the nerve whereas facet joint pain stays specific in the area. You can get referred pain from the facet joints which will extend anywhere up from 12 to 18 inches from the area, but again this is not typical radiculopathy (nerve) type pain. 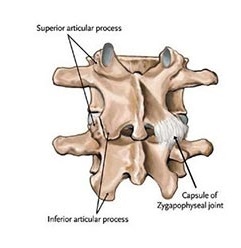 The facet joints are frequently strained by innocuous twisting and bending movements which produce a strain of the capsule and some local inflammation. Again, this is often misdiagnosed as a muscle spasm and although there will be muscle spasm present, it is usually secondary to the underlying joint irritation. Frequently if the facet joints get strained with relatively simple movements like bending to put on your shoes or turning to put the seatbelt on, it usually means that there is some underlying disturbance of mechanics which has allowed for the tissues to fail with relatively simple stresses. This is where the skills of an experienced physiotherapist are required in order not only just to treat the symptoms, but to evaluate the underlying mechanisms and causes of the sprain. One of the consequences of disc disease is a reduction in height of the disc which basically brings the two adjacent vertebrae closer together. 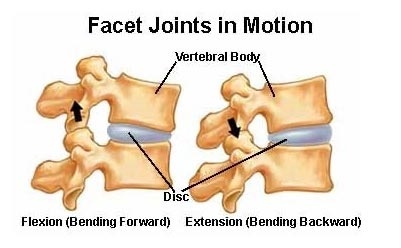 As discussed previously, the facet joints should normally not be weight-bearing so when the two vertebrae approximate, this causes more compression on the facet joints and can lead to inflammation and/or degenerative change. Lumbar spinal joint segments are often described as a three-legged stool with the disc and vertebrae body being the front column and main weight-bearing area representing one leg of the stool, and the two facet joints (one on either side) representing the other two legs. In the above example, if the front leg becomes shorter, this puts more pressure on the back two. Scoliosis is a change in spinal curvature from side to side. There are a number of contributory factors that can cause scoliosis, but in general they can either be congenital (you are born with them) or developmental. The effect of a side to side curve in the spine is to put asymmetrical pressure on the facet joints and this is a common cause of facet joint pain and irritation. If people have a congenital difference in leg length, or have suffered leg shortening because of a fracture, this effectively tilts the foundation of the spine and is another common cause of facet joint pain. It can be easily missed without systematic physical examination and therefore end up with treatment being directly entirely to the sore joints without addressing the underlying causes. 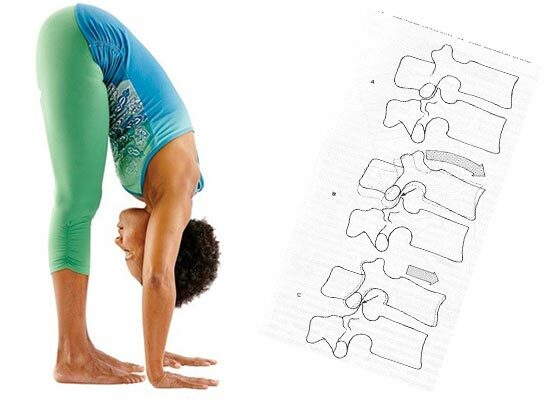 Spondylolisthesis is a condition where one vertebrae slips forwards most commonly, but sometimes backwards (retrolysthesis) on the vertebrae below. This usually happens as a result of repeated stress and can be a feature associated with degenerative disc disease when the disc becomes incompetent – failing hold the alignment of the vertebrae( like loose cement allowing blocks to move). One of the consequences of this is that the facet joints are placed under more pressure and are vulnerable to aggravation. This is a developmental situation whereby the alignment of the two facet joints is not symmetrical. The effect of the loss of symmetry is to cause pressure on the facet joints. By far the commonest cause of facet joint pain we see in the Clinic is an increased lumbar lordosis (or an increase in curvature of the lower back). The normal lumbar lordosis is anywhere between 7 to 15 degrees. When people have an increased lordosis, the lower back is over-arched (think of gymnasts) and this puts more pressure on the facet joints. Importantly, this is very frequently associated with the stomach muscles (core) functioning poorly, the gluteal muscles functioning poorly and often secondary tightness in the muscles on the front of the hip. If these physical signs are present, then it is obviously imperative to address these as part of a total management package. Again as with most spinal conditions, treatment is dependent upon the phase of irritation and the extent of change. The acute first aid pain management usually involves graded joint mobilisation, stretching to relieve pressure, anti-inflammatory modalities, muscle relaxing techniques and postural support if required. In the sub-acute phase, treatment is directed towards regaining movement and improving function which usually involves a combination of manual therapy, progressive muscle strengthening and functional re-education.